Veteran umpire John Hirschbeck will retire, capping off his 34-year MLB career with a postseason run in 2016, his 14th such journey into October and first Division Series since officiating the 2013 Division and World Series. Hirschbeck's retirement will officially take effect after he works the 2016 Fall Classic. Hirschbeck made his debut in 1983 with the American League seven years after graduating second in his class (Gerry Davis was first) from the Al Somers Umpire School, now operated by Hunter Wendelstedt. Hirschbeck's first year as a professional umpire in Class A's Florida State League featured 28 ejections. Hirschbeck hails from Bridgeport, Connecticut and holds a Bachelor of Science degree in Physical Education from Central Connecticut State University (1976). When the umpires of the unified Major Leagues sought to form a new union in 2000, following 1999's failed bargaining strategy, Hirschbeck was elected the World Umpires Association's first President, an office he held until 2008, when Joe West took over as union chief. 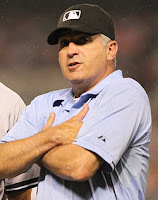 Hirschbeck received the UEFL's Crew Chief of the Year Award in 2013, and was an Honorable Umpire of the Year in 2014 and 2015. It was in 2014 that Hirschbeck lost his second son to ALD, having lost his first in 1993. Hirschbeck himself survived two occurrences of testicular cancer (2008, 12) and missed most of the 2014 season while on bereavement leave. Upon his return to baseball ahead of 2015, Hirschbeck announced he planned to dedicate the 2015 and 2016 seasons to his late son Michael. Hirschbeck confirmed his 2016 retirement to Vindy.com, a local news source for Hirschbeck's residence in Poland, Ohio. Hirschbeck's career concludes with 97 Major League ejections, including that of Miguel Sano for arguing a strike three call on April 10, 2016, down from seven ejections in 2015, which includes his postseason ejection of Troy Tulowitzki for arguing a strike three call. He is the third umpire to announce his retirement in 2016, following Bob Davidson and Tim Welke, who began the 2016 baseball season on the Disabled List.